Treatment: Medications = Synthetic vs. Natural, Natural Remedies to help heal or reverse symptoms and necessary Vitamins, Minerals and Supplements, to give your body what it needs to regain and maintain balance and strength. 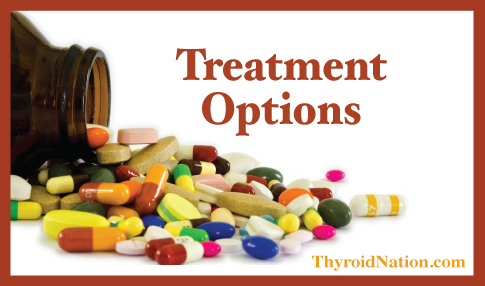 Treatments for thyroid disorders rely mainly on medicines and surgery. Your doctor will make an evaluation based on your particular thyroid condition as well as your age, general health and medical history. Treatment may involve medication, radioactive iodine treatment, or surgery, or a combination of these. As well as medications and supplements for vitamin and mineral deficiencies. a) T4-only medications have a miserable history, whether you feel well right now or not, leaving us with our own degree and kind of lingering symptoms of hypothyroidism…sooner or later. More in Chapter 1 of the revised STTM book. b) The TSH lab test result can be “normal” for years while we suffer from clear hypothyroid symptoms. Even worse, using it while on thyroid meds seemed to STILL keep us hypothyroid! See Chapter 4 about the TSH. Natural Desiccated Thyroid–a better treatment is discovered All along, there was always a treatment which worked better–natural desiccated thyroid. Changing over to this simple, regulated, consistent and quality natural medication has changed lives! It has exactly what our own thyroid would make: T4, T3, T2, T1 and calcitonin. Some doctors will exclaim that it’s complicated, unregulated, inconsistent and unreliable. NOT SO, say patients! Levothyroxine is a replacement for a hormone normally produced by your thyroid gland to regulate the body’s energy and metabolism. Levothyroxine is given when the thyroid does not produce enough of this hormone on its own. It treats hypothyroidism (low thyroid hormone). It is also used to treat or prevent goiter (enlarged thyroid gland), which can be caused by hormone imbalances, radiation treatment, surgery, or cancer. Synthroid is a BRAND name for the generic, Levothyroxine or L-thyroxine. It is a synthetic thyroid hormone that is chemically identical to thyroxine (T4), which is naturally secreted by the follicular cells of the thyroid gland. It is used to treat thyroid hormone deficiency, and occasionally to prevent the recurrence of thyroid cancer. Like its naturally secreted counterpart, levothyroxine is a chiral compound in the L-form. The related drug dextrothyroxine (D-thyroxine) was used in the past as a treatment for hypercholesterolemia (elevated cholesterol levels) but was withdrawn due to cardiac side effects. (levothyroxine sodium tablets, USP) contain synthetic crystalline L-3,3′,5,5′-tetraiodothyronine sodium salt [levothyroxine (T4) sodium]. Synthetic T4 is identical to that produced in the human thyroid gland. Levothyroxine (T4) sodium has an empirical formula of C15H10I4N NaO4• H2O, molecular weight of 798.86 g/mol (anhydrous), and structural formula. Desiccated thyroid extract is prepared from pig thyroid glands. The glands are dried (desiccated), ground to powder, combined with binder chemicals, and pressed into pills. This was a new use for parts that were previously unwanted slaughterhouse offal, and Armour and Company, the dominant American meatpacker in the 20th century, supplied the best-known brand of thyroid extract. Refers to porcine or bovine thyroid glands, dried and powdered for therapeutic use. [1A] Animal extract thyroid preparations were developed in the late 19th century, and are still in use today for the treatment of hypothyroidism. This product is sometimes referred to as “natural thyroid”, “natural thyroid hormones”, “pork thyroid”, thyroid USP, thyroid BP, or by the name of a commercial brand, such as “Armour Thyroid” or “Nature-Throid” & “Westhroid”. Desiccated thyroid has been described in the United States Pharmacopoeia for nearly a century as the cleaned, dried, and powdered thyroid gland previously deprived of connective tissue and fat… obtained from domesticated animals that are used for food by man (USP XVI). In the last few decades, pork alone is the usual source. Before modern assays, the potency was specified only by iodine content (“not less than 0.17% and not more than 0.23%”), rather than hormonal content or activity. If the conversion of T4 to T3 does not happen, or happens at a diminished rate, a hypothyroid person will not receive the benefits from a T4 hormone replacement alone as they may still be deficient in T3. 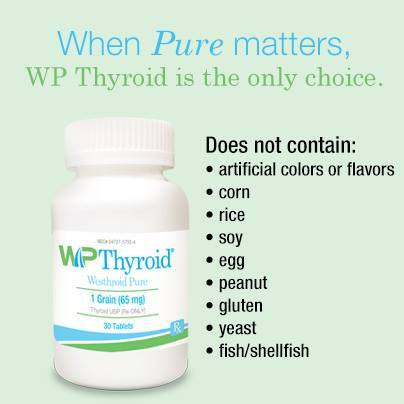 WP Thyroid is the purest treatment for hypothyroidism and replaces both T4 and T3 hormones. What can YOU do, to take back control over your health? Because Hashimoto’s thyroiditis can result in reduced digestive capabilities, it is a good idea to support digestion with enzymes, HCl and probiotics when necessary, and to supplement with extra quantities of the nutrients most often found lacking with this condition. Whole foods-based multi-vitamin and mineral: Take as directed. Extra antioxidants: Take as directed daily (Shames & Shames, 2005; p. 97). 1,000–2,000 mg per day, two divided doses (Shames & Shames, 2005; p. 97; Ross, 1999; p. 245). Extra B vitamins: Either in supplement form or, preferably, use nutritional yeast. Calcium: 250–300 mg (1–2 at bedtime) (Ross, 1999; p. 245). Calcium and iron need to be taken two hours before or after thyroid medications so as not to interfere with their absorption. Magnesium: 200 mg 2 times daily (Ross, 1999; p. 245; Shames & Shames, 2005; p. 97). Selenium: Supplementation with selenium (200 mcg) for a period of 3 months has been found to significantly reduce thyroid peroxidase autoantibodies (TPOab) titers and significantly improve well-being and/or mood (Toulis & Anastasilakis et al., 2010). NOTE: Selenomethionine form preferred. Do not exceed 400 mcg daily if pregnant! Vitamin D3: Often low in those with autoimmune conditions, it is necessary for optimal immune function (Hayes, Nashold, Spach, & Pedersen, 2003). It is also required for thyroid hormone production (Shames, in Shomon, 2007). 1,000–5,000 IU daily to bring up levels. Maintenance doses will vary. L-Tyrosine: One of the thyroid’s hormone building blocks. Many sources recommend 500 mg twice daily, but others feel that levels of this amino acid are rarely low enough to warrant supplementation (Shames &Shames, 2005; p. 108). Iron: If testing shows a deficiency. Calcium and iron need to be taken two hours before or after thyroid medication so as not to interfere with its absorption. 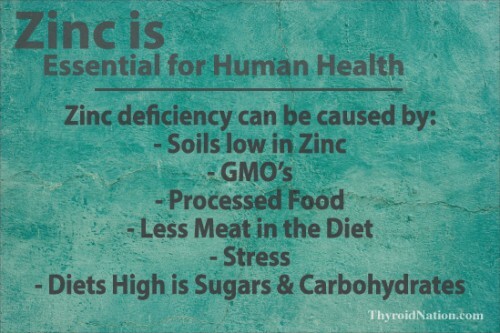 Zinc: If testing shows a deficiency. 50 mg daily (Balch, 2000; p. 452). Thyroid glandulars: These have been shown to be very effective; 50–100 mg twice daily. They are made from desiccated thyroid glands of either pigs or cows (use those from non-BSE cow-raising countries), from which most of the hormone has been removed. Dr. Shames likens them to decaffeinated coffee: there’s still a little bit in there (private conversation, May, 2007). Because of this, they also contain T1 and T2, other thyroid hormones that may exert a physiological effect. Additional supplements, recommended by Dr. Shames, are extra free-form amino acids daily (two 500 mg capsules), taurine (two 500 mg daily), and proteolytic enzymes on an empty stomach for inflammation (Shames & Shames, 2005; p. 97). Carotene is a precursor of Vitamin A. An underactive thyroid gland cannot efficiently convert carotene to usable Vitamin A so however many carrots etc. you eat, it won’t help. Vitamin A must also be accompanied by protein to make it available to the body, so if you are on a low protein diet, you may be deficient in this vitamin. If you are low on Vitamin A, your ability to produce TSH is limited. This vitamin is required by the body to convert T4 to T3. If you find that lights are too bright or night driving is a problem, try taking Vitamin A supplements along with more protein and see if it helps. All the B vitamins are vital for good thyroid function but they all have a different role to play. This vitamin is drastically needed if you have an overactive thyroid. This is needed to keep all the body’s cells (including the endocrine glands) in efficient working order. 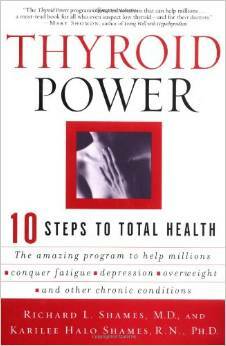 Without this vitamin the thyroid cannot utilize its iodine raw material efficiently to make the hormones. This vitamin is needed even more by an overactive thyroid. Muscle weakness is very common in people with an overactive thyroid and in those who are also lacking in B6. People with an underactive thyroid or people with no thyroid cannot absorb this vitamin. A serious lack of B12 can cause mental illness, various neurological disorders, neuralgia, neuritis and bursitis. Some doctors believe the “normal range” of B12 is too low and that the normal range should be at least 500 – 1,300pg/ml (rather than 200 – 1,100). The thyroid gland needs this vitamin to keep it healthy. Long standing deficiency causes the thyroid gland to secrete too much hormone. People with an overactive thyroid need extra Vitamin C as this is actually drained from the tissues in their bodies. It has been found that when people with an overactive thyroid take this vitamin, it counteracts the usual rapid excretion of calcium, and osteoporosis can be avoided. Go outside and get some SUN! Again, lack of this vitamin encourages the thyroid gland to secrete too much hormone, as well as too little TSH by the pituitary gland. A higher intake of this vitamin is often needed by people with an overactive thyroid to counteract the large amounts of the vitamin depleted from the system. Many of us consume too little calcium in the form of dairy products. This is needed to combat bone loss, especially important in overactive people. Dr. Arem recommends a supplementation of 1000 milligrams of elemental calcium (calcium carbonate) per day. Magnesium is required for the conversion of T4 into T3 so this mineral should be supplemented. Dr. Magovern tells us that some people lose Magnesium at a great rate through urination. Also it seems that a diet high in refined food and caffeine will encourage magnesium loss. This is a crucial component of the enzyme that converts T4 to T3 in the body. Without it, T3 cannot be produced in the right amounts, and organs will function as if they were hypothyroid even though blood test levels are normal. Research has shown that both hypothyroidism and hyperthyroidism result in zinc deficiency. It also plays a role in the functioning of the immune system. Low zinc levels have been found in obese people. Zinc is needed to convert T4 into T3, so this mineral is a must. 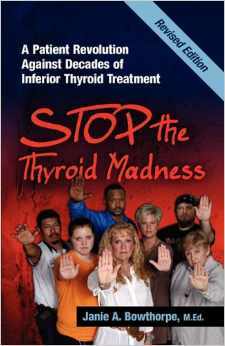 Thank you, Thyroid UK for providing this wonderful resource! *Always consult with your primary care physician before starting any prescription, vitamin or supplement routine.